Dental bonding is a common procedure that can benefit patients in a wide variety of ways. In this blog, the doctors at Dental365 in New York explain the top reasons to consider dental bonding. Dental bonding is the application of tooth-colored composite resin to repair a tooth. The material is applied to the tooth and is hardened and bonded to the tooth using a special light or laser. Bonding can be completed in one office visit. In many cases, anesthesia doesn’t need to be used. If the procedure is being performed to repair a decayed tooth, a tooth needs to be drilled to fix its shape, or if the damage is located close to a nerve, anesthesia may be needed. Your dentist will choose a resin color that best matches the natural color of your teeth. The surface of your tooth or teeth being treated are then etched to roughen it, and a liquid is applied to help the resin adhere to your tooth. Since the resin has a putty-like consistency, it can be molded and smoothed into the needed shape. A bright light or laser hardens the material, and your dentist can make further refinements to the resin. 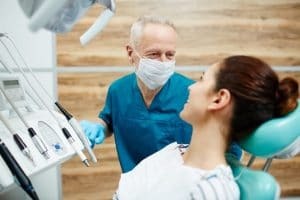 How do you care for bonded teeth? For 48 hours after your procedure is completed, avoid eating or drinking foods or beverages – like coffee or tea – that could stain your teeth. You should also avoid smoking. The resin isn’t as strong as your natural teeth, so you should also avoid biting your fingernails, chewing on ice, or using your teeth to open things. If you want to find out more about dental bonding or other ways to improve the health and appearance of your smile, call or stop by today at one of Dental365’s convenient offices located throughout NYC and Long Island.